*The grand prize is divisible. **The total amount payable for prizes in the 6/7+ bonus number category is limited to $700,000 per draw. If this limit is reached, the prize amounts will be determined in proportion to the number of winning selections in this category. The two have been on cloud nine and experienced every emotion since finding out. They’ll now be able to turn their dreams into reality! They had to have their ticket checked twice before it sunk in that they’d won a million dollars. The jackpot starts at $10,000,000 and, if not won, grows by at least $5,000,000 per draw up to the maximum jackpot of $60,000,000. Maxmillions (prizes of $1,000,000) are offered when the jackpot reaches $50,000,000. Notably, when the amount of the 7/7 pool for any given draw exceeds $50,000,000, it shall be capped at an amount set between $50,000,000 and $60,000,000 inclusive (the “7/7 pool cap”), and the excess isdivided into additional prizes of $1,000,000 (Maxmillions). The difference is added to the 6/7+B pool. For example: The advertised jackpot (the 7/7 pool cap) is set at $50,000,000. 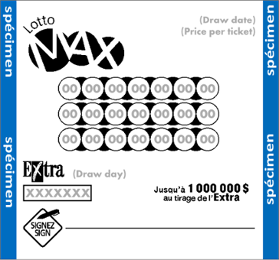 If the 7/7 pool reaches $52,214,000, on top of the $50,000,000 jackpot, two Maxmillions will be drawn. The remaining amount of $214,000 would be added to the 6/7+B pool. If the $50M jackpot is not won, the Maxmillions that were not won are added to those of the next draw. Thus, if the 2 Maxmillions are not won, the offering could increase, for example, to $55M + 4 Maxmillions, then to $60M + 6 Maxmillions. If the $50M jackpot is won, the Maxmillions that were not won are added to the jackpot pool for the next draw. The jackpot for that draw will then be $10,000,000 + the Maxmillions that were not won. The main draw is conducted using a single ball machine containing balls numbered from 1 to 49. Eight balls are drawn at random from the ball machine. The first 7 balls form the winning selection and the 8th ball represents the bonus number. It should be noted that beginning May 14, 2019, the Lotto Max main draw will be conducted electronically, using a certified random number generator. In the event Maxmillions are also offered, the draw for each of these prizes is conducted electronically using a certified random number generator. To win, you need to get, in a single selection, 3, 4, 5, 6 or 7 numbers identical to those of the winning selection. The bonus number, represented by the "+ B" symbol, is associated only with the categories 6/7+ bonus and 3/7+ bonus. To win in these categories, a single selection must contain respectively, in addition to the bonus number, 6 or 3 numbers identical to those of the winning selection. A selection is a winning selection of a Maxmillions prize if it contains all 7 numbers of a same single Maxmillions drawn selection. Lotto Max is governed by the Rules and Regulations respecting Lotteries and Lottery Tickets of the Interprovincial Lottery Corporation («ILC»), which include limitations of liability. Lotto Max is a variable-prize game. Prizes are calculated according to sales and divided among the winners in each category. **Pools fund: Total sum of prizes minus the sum of fixed prizes (3/7, 3/7+B and 4/7). The maximum jackpot will increase from $60 million to $70 million. Draws will be conducted twice each week: Tuesdays and Fridays. The odds of winning the jackpot with one play will be 1 in 33,294,800. **Pools fund: Total sum of prizes minus the sum of fixed prizes payable to winners of the 3/7, 3/7+B and 4/7 categories. Maxmillions ($1 million prizes) will continue to be offered once the jackpot reaches $50 million. The cost of a play will remain at $5 for three 7-number selections. The theoretical payoff rate will remain at 48%. Note: Free play tickets are subject to the game conditions in effect on the draw date for which the free play ticket is issued. Therefore, if you present a winning ticket for a Lotto Max free play to a retailer on or after May 11, 2019, the play thus issued will be subject to the new game conditions indicated below, which include the above changes.